When I planned the coddiwomple, I expected to camp under the stars or in my tent every night, but as it turns out, Bella and I will be enjoying hospitality offered by family, friends, and co-workers along the way. For example, we stayed with my daughter Brie in northern Virginia our first night of the trip. 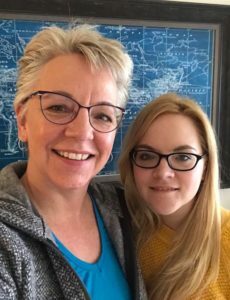 I stayed with my daughter in Virginia on the first night of my trip. Bella and I arrived around 9:30 pm, having gotten a late start because there were so many work-related tasks to complete before I could leave with a clear conscience. Fortunately, I had finished packing my SUV (which now qualifies to be called an RV, I think) the weekend before. The drive from NJ to VA took about 6 hours, since we took the prettier route down Route 78 through rural NJ and PA toward VA rather than sticking to the I-95’s ugliness. And….we took bio and stretch breaks every two hours. Bella was a trouper, given than heelers have the capacity to drive cattle for hours without tiring. Brie and I had a nice visit before bed, but Bella was up most of the night, distracted by unfamiliar house sounds. She also had the adventure of her first flights of stairs (nervous initially but caught on fast), and new toys to chew, compliments of Brie’s dog. 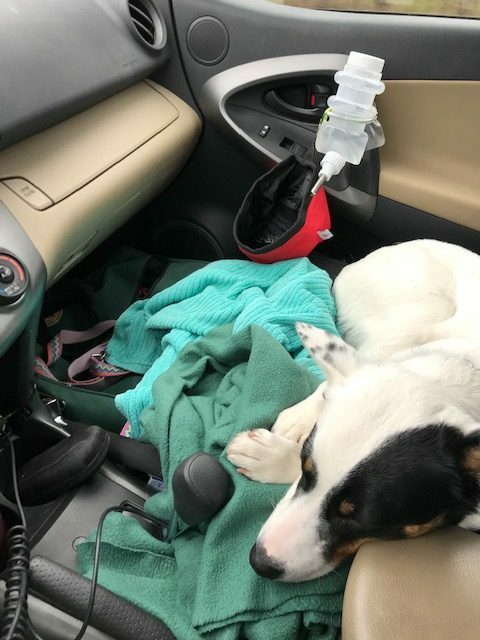 It was interesting to see her perk up in the car when certain odors wafted in — skunks, cattle, waterways. She was calm except when we drove through a steel covered bridge — the minute she saw it ahead, she cowered in her seat. Maybe it triggered a memory of her puppyhood or the cage she was in after being rescued from a Texas road and brought to New Jersey, via the Big Dog Rescue Project. Bellas nest in the front seat. She wears a chest harness-style seat belt. I enjoyed seeing the countryside, but it brought back memories of helping Brie create a fourth-grade diorama of a Lenni-Lenape village for a school assignment. We used miniature railroad gravel to imitate oyster shells and fake grass to imitate New Jersey’s rolling hills. It was a cute diorama, but it didn’t depict the reality of the tribe’s history. Their culture dates back 10,000 years; indeed, their name means Original People. But, as happened so cruelly and often, the U.S. Government forcibly relocated the tribe to make way for white people. I wish I had guided Brie to create a diorama that illustrated the devastating impact of white supremacy culture on the Lenni-Lenape, but it didn’t occur to me at the time. I’ve learned since that the ability to not think about racial harm is an outgrowth of white supremacy culture. Thanks to my Unitarian Universalist faith community and workplace trainings, along with invaluable conversations with friends and colleagues, I’ve learned a lot since the diorama days. But UUism and I have far, far to go, as do white people in general. I’m still learning and making mistakes and trying harder everyday to remain aware of and to shake off my white privilege. Part of that is to honor the history of the land I’m traveling through on my loop around this country. Another part is to educate myself and share resources. To that end, I encourage white readers, especially “I’m not a racist”-thinking people like myself, to learn how white supremacy culture and its associated privilege affects us on a personal level. A good place to start is Layla F. Saad’s Me and White Supremacy Workbook. Now it’s time to put away this laptop and explore.